HAPPY SOLSTICE: This morning, Dec. 22nd at 6:08 am UT, the sun reached its lowest declination of the year: -23.5 degrees. Astronomers call this the winter solstice; it marks the first day of winter and the longest night of the year in the northern hemisphere. In the southern hemisphere, where things are reversed, it marks the beginning of summer and the longest day. Either way, happy solstice! URSID METEORS: Comet 8P/Tuttle is coming and it is bringing a meteor shower with it. "We could be in for a Merry surprise on Dec. 22nd when Earth passes through a trail of comet dust," says astronomer Peter Jenniskens of the SETI Institute. Previous returns of Comet Tuttle to the inner solar system have been attended by outbursts of meteors, most recently in 1980 and 1994. During those flurries, dozens of meteors per hour flowed from the constellation Ursa Minor--hence the name of the shower, "the Ursids." 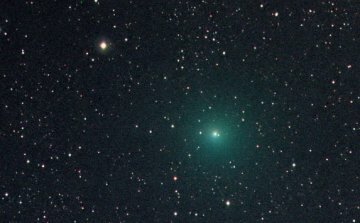 Although Ursids have a reputation for being faint, "we are not certain about this," says Jenniskens. "Because winter weather keeps many observers indoors, Ursid outbursts have never been widely observed and they may contain a fair number of bright meteors. We have a lot to learn." That's why he hopes sky watchers will keep an eye on the northern sky this weekend; Ursid meteors emerge not far from the north star, Polaris. According to models by Jenniskens and colleagues, the peak will occur between 2100 and 2200 UT (4-5 pm EST) on Dec. 22nd with meteors visible as much as four hours before and after that time. Anything could happen, from a dud to a blast. Bundle up and look! 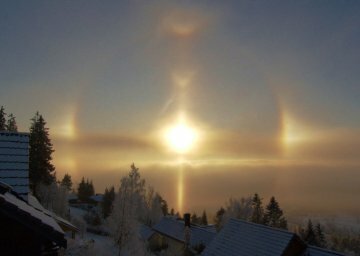 "The Moilanen arc, the V-shaped arc closest to the sun in this picture, is named after its discoverer, Jarmo Moilanen of Finland. It is a mystery. We can simulate it mathematically using a sharp prism with faces tilted 34 degrees to each other instead of the usual 60 degrees of ordinary ice crystals. That is the easy bit! We do not yet know what real crystals in the sky make it. They could be twinned crystals, two interlocking crystals, or something even more exotic. 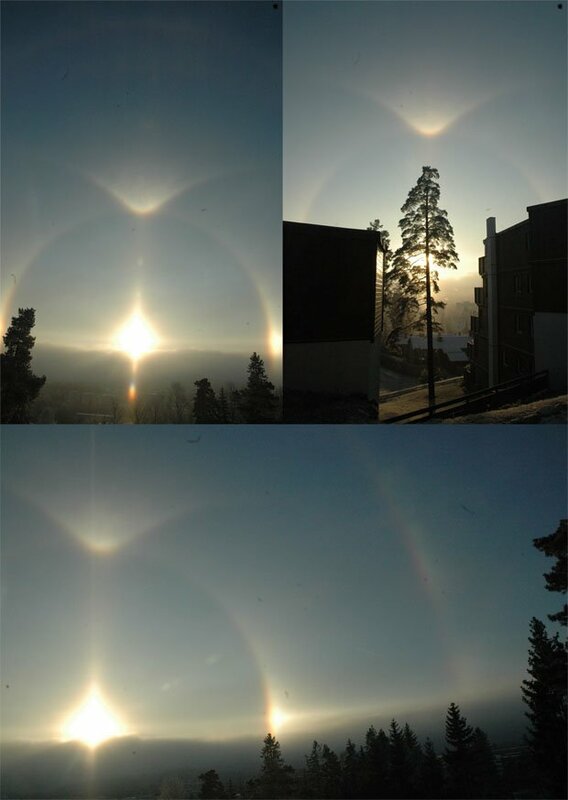 Look out for it and, who knows, you might also discover your own halo!" On December 22, 2007 there were 913 potentially hazardous asteroids.